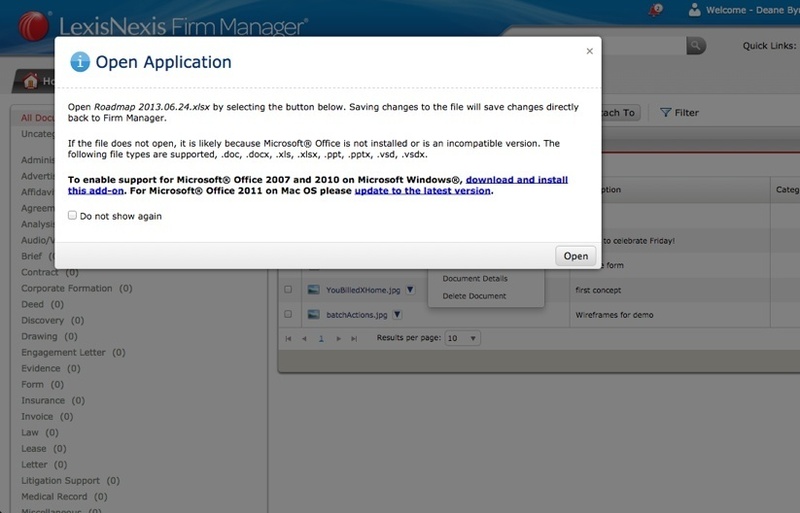 Firm Manager, the LexisNexis online practice-management platform for solo and small-firm attorneys, rolled out several enhancements yesterday, the most notable of which is in-app document editing. This new feature allows a user to open, edit and save documents from within the Firm Manager application. The feature works with the Microsoft Office 2013 productivity suite – including Microsoft Word, PowerPoint, Excel and Visio programs. A second new feature introduced yesterday is an invoice status display alongside the matter view. With this feature, as a user views a matter, the status of the top three paid and unpaid accounts is presented on the screen. The intent is to provide a simple way to stay abreast of client payments and collectibles. In the months since, Firm Manager has also added a “Money Finder” feature (which I described here), a new synchronization feature with Google Calendar, and custom billing and invoicing. Firm Manager is $44.99 a month for the first user and then $29.99 a month for additional users.